"We now know a bit more about the identity of that person". One witness claimed the assailant was yelling "allahu akbar" and is believed to be known to counter-terrorism agencies, the Melbourne Age reports. The incident is being treated as terrorism, police said. A man was arrested at the scene and has been taken to hospital under police guard in a critical condition. The journalist also said an emergency speaker system was warning people to avoid the area. 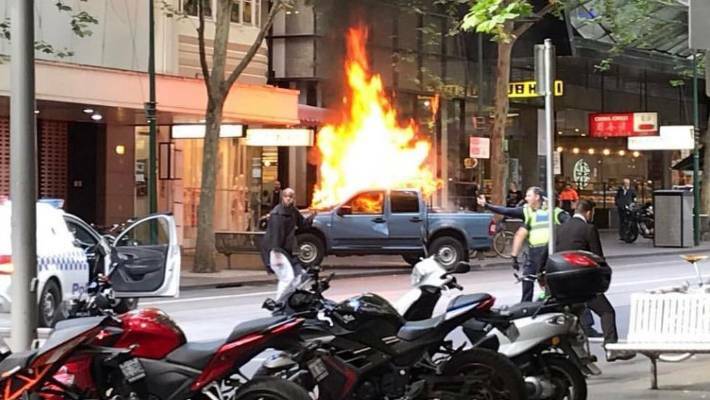 A major police incident has unfolded on Bourke Street, with one person confirmed dead and a knife-wielding man shot by police. Civilians used an outdoor chair and a shopping trolley in attempts to help police stop a man who allegedly attacked people on Bourke Street, Melbourne, killing one. Around thirty minutes later, the man succumbed to the gunshot wounds. Video posted to Twitter and broadcast on television showed the man swinging a knife at two police officers in the city's crowded downtown area, while a vehicle burned in the background. Trams along Swanston, Bourke and Elizabeth streets have been stopped. He then engaged with members of the public at that location, " he said. "I'm pretty sure he got stabbed in the face". "Police shot the male in the chest and he is now in a critical condition in hospital", Superintendent Clayton said, adding the officers are okay". Witness Drew Hair told AAP that the suspect was dressed in a black tunic and white trousers and was about six foot four inches tall and of African appearance. "I think all Victorians like myself would say that we do not have to live like this", he said. "Everyone started running. It was so scary". The militant "Islamic State" (IS) group claimed Friday's attack on the group's Amaq news website, saying that one of its fighters carried out the attack.